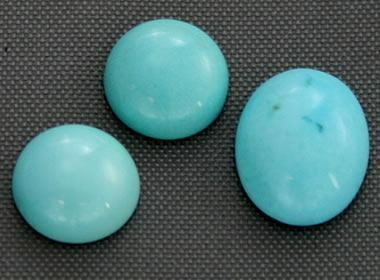 Arizona turquoise: Cabochons cut from turquoise produced from the Sleeping Beauty Mine, known for producing turquoise that is relatively free of matrix. Arizona has one of the longest histories of gemstone production in the United States. Native Americans began producing Arizona turquoise over 1000 years ago. They used it to make beads and small sculptures. Historically, Arizona has been the world's leading producer of turquoise and the leading producer of gem-quality peridot. The state has consistently been one of the leading gemstone producers in the United States on the basis of value reported by the United States Geological Survey. 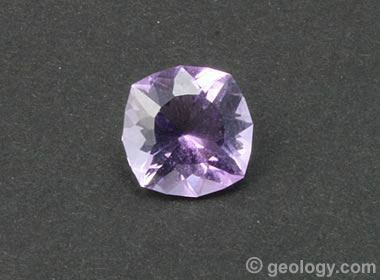 Arizona amethyst: Faceted amethyst cut from material produced at the Four Peaks Mine. Arizona is world-famous for its turquoise, peridot, and petrified wood. The state is also famous for copper, and a variety of copper minerals are mined as gemstones. These include azurite, chrysocolla, and malachite. Other Arizona gem materials include agate, amethyst, garnet, jade, jasper, obsidian, onyx, opal, and petrified wood. Turquoise rough: A specimen of rough sky blue turquoise in host rock from Mohave County, Arizona. Specimen and photo by Arkenstone / www.iRocks.com. Turquoise is Arizona's most important gem material. It ranks first in value of production and is the most widely known of Arizona's gemstones. In 1974 the Arizona Legislature designated turquoise as the official state gemstone. Chemically, turquoise is a hydrous phosphate of copper and aluminum. It is often associated with rocks that can be mined for their copper content. Some turquoise mines and deposits in Arizona were displaced as copper companies acquired acreage and opened very large copper mines. Gemstone turquoise production is done by careful hand extraction, thus it is generally not part of the business plan of a major copper mine. However, it can be a byproduct of copper mining. Some copper mines exploit a nice turquoise find with their own staff, while others have on-call gem miners who receive limited-time access to a new find. 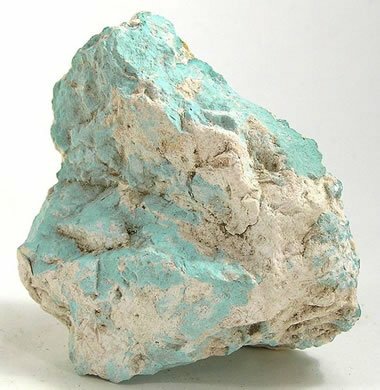 Although turquoise produces income for some mines, the reward from producing it can be offset by the cost of disrupting a large mining operation with hundreds of employees. A few copper mines plan operations in ways to allow copper and turquoise to be mined at the same time. Some Arizona turquoise localities are world-famous and produce turquoise with a characteristic color and appearance. These mines include: Kingman (famous for its "high blue" color and black matrix), Sleeping Beauty (known for its soft blue color and lack of matrix), Morenci (known for its dark blue color and pyrite-studded matrix), and Bisbee (known for its high blue color and chocolate-color matrix). Ant Hill Garnet: An "ant hill garnet" with spectacular red body color from Garnet Ridge, Arizona. The stone is a 7.6 x 5.7 mm oval and about 1.02 carats. Photograph by Bradley J. Payne, G.J.G. of TheGemTrader.com. One Arizona gemstone that makes people smile is the "ant hill garnet." These are tiny garnets, rarely over one carat in weight, that are mined by ants in the process of excavating their homes. The ants haul the gems to the surface and discard them on the anthill. The rain washes away the dirt and moves the stones to the flanks of the ant hill. Native Americans have known about these garnets for generations. Today they collect them in large numbers and sell them in parcels to rockhounds and lapidaries. They are then cut into gems and used to make novelty jewelry. Many ant hill gems are a red chrome pyrope garnet with a high color saturation. The stones are small enough that they exhibit a rich ruby-red color when faceted or cabbed. Arizona peridot: Faceted peridot from basalt flows on the San Carlos Reservation. When the mineral olivine is of gemstone quality, it is known as "peridot." 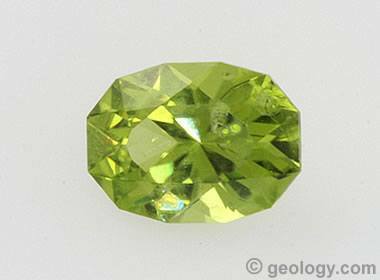 It is a bright yellow-green to dark green gem material that can be cut into beautiful faceted stones. Arizona is the world's leader in the production of gem-quality peridot. Most of it is produced from the Peridot Mesa and Buell Park areas of the San Carlos Reservation. The peridot occurs as xenoliths within basalt flows and is exposed by hard rock mining. Stones are also found in the soils above the basalt flows and in the sediments of nearby washes. Most of the stones are very small (less than 5 carats) and heavily included, but many very high quality pieces are found. Arizona Gem Silica: Two gem silica cabochons cut from material produced at the Inspiration Mine, Gila County, Arizona. Gem silica is a bluish green to greenish blue variety of chalcedony. It receives its vivid blue-green to green-blue color from the presence of copper. It is often called "chrysocolla chalcedony" or "gem silica chalcedony." It is one of the most valuable varieties of chalcedony. Nice cabochons can sell for over $100 per carat. Gem silica is a rare material that has only been produced at a few locations worldwide. The Miami-Inspiration Mine in Gila County, Arizona is one of the most recent sources of gem silica. In the early 1900s the Keystone Copper Mine, also in Gila County, was a source of gem silica. This is a gem that you will not find in the typical mall jewelry store. Much of the best gem silica is in the hands of mineral and gem collectors. So little has been produced and quality cabs are so costly that you will be lucky to find it anywhere. Your best chance will be a jewelry store that specializes in high-quality one-of-a-kind items. Arizona petrified wood: Tumbled stones made from Arizona petrified wood, exhibiting bright colors and interesting wood grain. Rock tumbling is a very popular hobby in Arizona where petrified wood, agate, and jasper can be collected in abundance. The world's most significant petrified wood locality is located near Holbrook, Arizona. Here, about 225 million years ago, an enormous number of trees were buried by stream sediments and volcanic ash. Over time, silica-rich ground water petrified the wood and converted it into chalcedony. Dissolved elements in the waters gave the chalcedony vivid colors. Later, weathering and erosion unearthed the logs, and today they are scattered across the land surface because the hard chalcedony is more resistant to weathering than the soils around it. A portion of the area has been set aside as Petrified Forest National Park; however, there are many locations outside of the park where lapidary-quality petrified wood has been produced. Arizona petrified wood is some of the most colorful in the world, with red, orange, yellow, white, blue, violet, gray, and brown being common colors. Petrified wood is used to produce cabochons, beads, and other jewelry items. Most of the wood that is high enough quality to polish is used to make ornamental objects such as tabletops, bowls, bookends, paperweights, desk sets, small sculptures, and tumbled stones. Arizona azurite, malachite, and chrysocolla: This photo shows several cabochons cut from Arizona copper minerals. 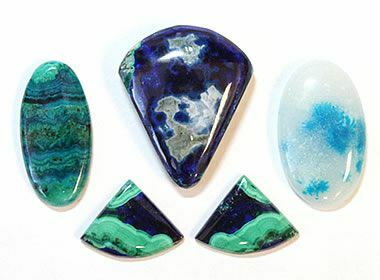 They are an oval of chrysocolla and malachite on the left; three triangular cabs of azurite and malachite; and on the right, a quartz cabochon with chrysocolla inclusions. All materials were found in the Morenci area, a famous copper locality. In addition to turquoise, many other copper minerals can be used as gemstones. In Arizona, chrysocolla, malachite, and azurite with beautiful blue and green colors are often found. They can be cut into beautiful cabochons and used in jewelry. These are soft minerals that scratch easily, so stones cut from them are best used in jewelry such as pendants and earrings that will not encounter abrasion or impact. They are attractive and popular gems. 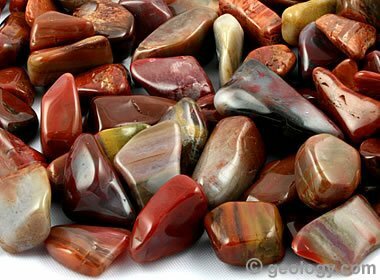 Agate and jasper are very common materials that occur in many parts of Arizona. They can be easily found in streams, dry washes, and scattered on the surface where vegetation is sparse. Many specimens are colorful, and that makes them a favorite of Arizona rockhounds. Without a doubt, these two materials are found in tonnages that exceed all other types of gemstones combined. As a result, they are always running in rock tumblers and being cut by lapidaries across the state. The most beautiful specimens are often sliced and cut into cabochons for use in jewelry. Larger colorful specimens are used to make book ends, desk sets, clock faces, and many other craft projects. Arizona Apache Tears: Apache tears are nodules of obsidian that can be tumbled to a brilliant luster in a rock tumbler, or sliced and cut into faceted stones or cabochons. Apache tears are nodules of translucent obsidian that can be collected in parts of Arizona that have geologically recent volcanic activity. 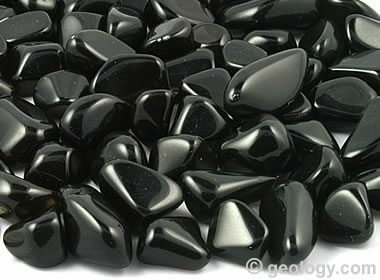 They are often tumbled to produce jet-black polished stones. They can also be sliced and cut into faceted stones or cabochons. They are a popular souvenir sold in gift shops throughout the state.